David Ogilvy passed away in July, at age 88. Surprisingly, many people you talk to these days have never heard of him, but he was perhaps the most famous of ad men; certainly the only one credited with contributing to the Industrial Revolution. He started out as a cook, then became a door-to-door salesman for Aga Cookers. During the war, he worked with British Security Coordination, then moved to Pennsylvania to live with the Amish and work as a farmer. Somehow, the next logical step became a move to New York, and the advertising industry. In 1948, he co-founded Hewitt, Ogilvy, Benson & Mather; in August, Vancouver became home to Ogilvy & Mather’s 360th office. Among Ogilvy’s pet peeves was the fact that many agencies, in their never-ending quest for increased billings, waste their clients’ money. By failing to learn from the experience of others in their industry. By encouraging or condoning Creative by Committee (a.k.a. ‘team work’ and ‘brain-storming’). By expending gobs of time and money on trying to be creative and entertaining and artistic, instead of producing advertising that makes people want to buy their clients’ products. Another complaint was that agencies, often only for the sake of creating something new, replace advertising that is working perfectly well, instead of staying with it until it stops working and product sales start to slump. You know the line in today’s Dove (soap) commercials: “Dove doesn’t dry your skin the way soap can”? Ogilvy wrote that. In 1958. 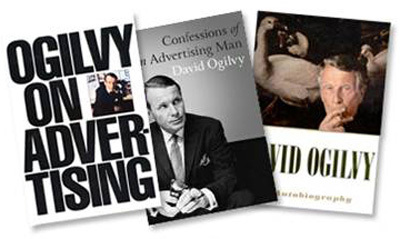 Ogilvy believed in the power of imparting information through words. 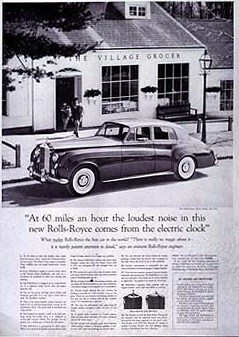 Today, writers have to slash copy to fit design, and grammar is rendered irrelevant; in one of David Ogilvy’s most successful car ads—for Rolls Royce—the ad consisted one photo and 607 words. In his view, education and research were paramount and the biggest waste of clients’ money stemmed from the failure of agency personnel to learn. About the products they’re trying to sell, how and why the products are made, how they work, how they fit into their industries, how they are viewed by consumers. And he urged everyone to watch what direct -response advertisers do—he believed that they were the most knowledgeable of all advertising professionals. He wrote three best-selling books on advertising. They should be read by everyone involved in marketing, advertising and public relations. Because there is no disputing that, even if he was a little pedantic, David Ogilvy was always right. This entry was posted in Marketing & Advertising and tagged Advertising, British Security Coordination, David Ogilvy, Dove, Dove Advertising, dove soap, Ogilvy, Ogilvy & Mather, Rolls Royce Ad.